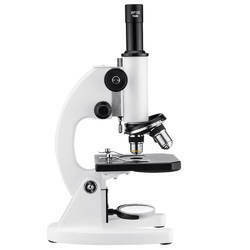 Our product range includes Microscopes such as Trinocular Microscope, Binocular Microscope, Monocular Microscope and Stereo Microscope. 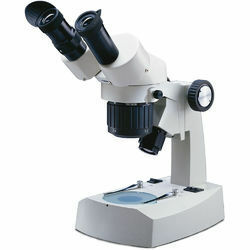 Perhaps the most Widely used and accepted Microscope by lab technicians allover the country. Stable 'Olympus' pattern body, Detachable Mechanical stage,Triple revolving nosepiece. 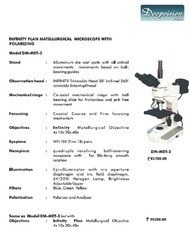 Moveable Condenser unit (NA 125) and other standard features.All optics are assembled from finest Lenses. Only selected 100x Lens is supplied.Two Hyrgenian Eyepieces : 10x W.F. and 5xThree Achromatic Objectives : 10x, 45x & 100x Oil ImmersionBoth 45X & 100X Spring loaded. (SL)Complete in Thermocole, cabinet as above with lock and key and cover etc. within the base, nicely packed in box. Microscope DXL25T Trinocular with Broad Base Coaxial Fine Coarse And Coaxial Stage With Halogen OR LED Light Wide-Field Model. (N.A. 1.25) with iris diaphragm can be moved up & down with the help of a knob. With COAXIAL Built-in Mechanical stage. All optics assembled from finest imported lenses. Supplied in cabinet with lock and key, in Thermocole.